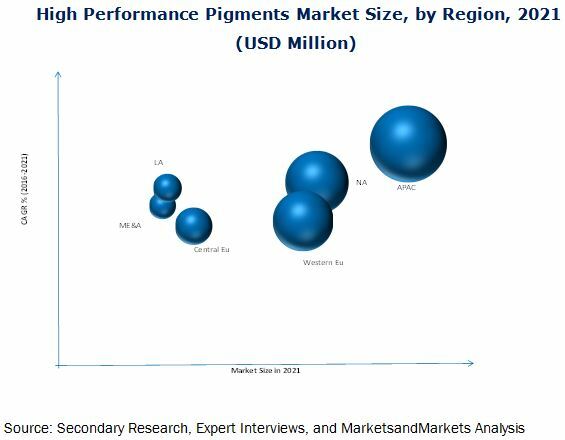 [147 Pages Report] The global high performance pigments (HPPs) market size was USD 4.56 billion in 2015 and is projected to reach USD 5.71 billion by 2021, registering a CAGR of 3.81% between 2016 and 2021. In this report, 2015 is considered as the base year and the forecast period is between 2016 and 2021. The market has been segmented on the basis of type, application, and region. The application segment is divided into coatings, plastics, inks, cosmetic products, and others. Coatings is the leading application, accounting for the maximum share of the overall HPPs market in 2015. HPPs are gaining momentum as they have superior properties, such as high lightfastness, fastness to chemical exposure, excellent weather fastness, and high heat stability, than conventional pigments. They also shows high color fastness and insolubility. These superior properties make these pigments suitable for applications, including automotive and decorative coatings, which require excellent light and weather fastness. HPPs also offers other performance characteristics for colorants such as luminescence, thermochromatic, fluorescence, and photochromatic properties. These properties and high performance characteristics offered by HPPs in their applications enhance the demand for HPPs in applications, such as coatings, plastics, inks, cosmetics, textile, and others, thus driving the growth of the HPPs market. This research study involves extensive usage of secondary sources, directories, and databases (such as Hoovers, Bloomberg BusinessWeek, and Factiva) to identify and collect information useful for this technical, market-oriented, and commercial study of the HPPs market. The primary sources are mainly several industry experts from core and related industries and preferred suppliers, manufacturers, distributors, service providers, and organizations related to all segments of the industry’s supply chain. After arriving at the overall market size, the total market has been split into several segments and sub-segments. The figure below shows the break-down of the primaries on the basis of designation and region conducted during the research study. The raw material suppliers for the HPPs market identified in the study are the suppliers of natural gas and its derivatives, cadmium, cobalt, copper, titanium, and other metal oxides. HPPs occur naturally during coal combustion process. The major value addition in the HPPs industry is in the manufacturing process where agreat amount of efforts and expertise is necessary to manufacture a pigment totally suitable to the specific end-use application. These HPPs are either sold directly to the end users or to the distributors. The major players operational in the global HPPs market are BASF SE (Germany), Clariant AG (U.S.), Huntsman Corporation (Japan), Lanxess AG (Germany), Solvay SA (Belgium), Atul Ltd. (India), Sudarshan Chemical Industries Ltd (India), Heubach GMBH (Germany), Sun Chemical Corporation (U.S.), Synthesia A.S. (Czech Republic), Ferro Corporation (U.S.), and Gharda Chemicals Ltd. (India). These companies have adopted various strategies such as expansions and new product launches to achieve growth in the global HPPs market. In February 2016, Sun Chemical Corporation introduced various resins and pigments under its waterborne offerings for industrial, architectural, and automotive coatings applications. In December 2015, BASF invested in its Nanjing, China production site to increase its high performance diketopyrrolopyrrole pigments (DPP) production capacity. This will help the company to strengthen its position in the global HPPs market. In July 2015, Ferro Corporation completed the acquisition of Nubiola, a pigment manufacturing company. This acquisition will strengthen the company's position in European market. This report categorizes the global HPPs market on the basis of type, application, and region. What are new product HPPs companies are exploring? Which are the key players in the HPPs market and how intense is the competition? The global high performance pigments (HPPs) market size was USD 4.56 billion in 2015 and is projected to reach USD 5.7 billion by 2021, registering a CAGR of 3.81% between 2016 and 2021. This high growth of the market is attributed to the increasing demand of HPPs from various applications such as coatings, plastics and cosmetic products in the U.S., the Middle East, Germany, France, China, India, and Japan. HPPs are used to impart color to products in various applications in end-use industries, such as automotive, paints & coatings, electronics, beauty, and textiles. They are a sub type of colorants. HPPs consist of organic and inorganic pigments, where organic are carbon based and inorganics are mostly metal oxide-based pigments. HPPs show various kinds of high performance properties in many applications. They have various superior properties such as lightfastness, enhanced durability and chemical resistance, which make it more suitable for various applications such as coatings, plastics, inks, cosmetic products, and others. The coatings application dominated the HPPs market during the forecast period, closely followed by plastics in 2015. Cosmetic products is the expected to witness the highest CAGR between 2016 and 2021 due to growing beauty industry in North America, Europe, and Asia-Pacific. The growing automotive industry in the U.S., the Middle East, and Asia-Pacific countries such as China, Japan, and India is also driving the growth of this market. The market for HPPs is classified on the basis of type: organic and inorganic/metallic HPPs. The HPPs market is dominated by organic HPPs because of their environmentally-friendly features. The organic HPPs segment is also projected to be the fastest-growing type of HPPs during the forecast period. It is most commonly used in the plastics, coatings, and cosmetic products applications. Currently, Asia-Pacific is the largest market for HPPs, in terms of value, closely followed by North America. Asia-Pacific is also the fastest-growing market for HPPs due to high demand in automotive and construction industries. The presence of major developing nations such as China, India, and South Korea is also a major driver of HPPs in the region. The HPPs market in North America is also expected to grow significantly due to growing demand in cosmetic products application. HPPs are used in various coating applications owing to their high performance characteristics, which imparts qualities to the end products, such as good weather and lightfastness, low migration, and solvent and bleeding fastness. HPPs are widely used in decorative coatings, automotive coatings, and industrial coatings. Automotive coatings is the largest consumer of HPPs, followed by industrial and decorative coatings. However, the use of HPPs in decorative coatings is estimated to increase in the near future owing to rise in the paints & coatings market for the construction industry. Plastics is the second largest application of HPPs. Pigments are used to impart color to the plastics. The demand for colorful plastic products is increasing, which is further driving the demand for HPPs. These pigments are used in plastics owing to their outstanding weather and UV resistance and high level of lightfastness. HPPs are added by a dispersion process into the polymer, while the polymer is in its liquid phase only. The global plastics market is estimated to register a significant CAGR of 5.7% from 2014 to 2020, which will ultimately drive the demand for HPPs in plastics application. HPPs are widely used in inks application. They are used as printing inks, especially ink jets. HPPs are used in solvent inks where chemical resistance is required. They are also used in laminating inks, especially for flooring. These are also used for outdoor packaging, retort packaging, and package printing of products that are displayed outdoors. The demand for some inorganic HPPs is decreasing in North America, Central Europe, and Western Europe owing to the declining publication industry, as an effort to protect the environment. 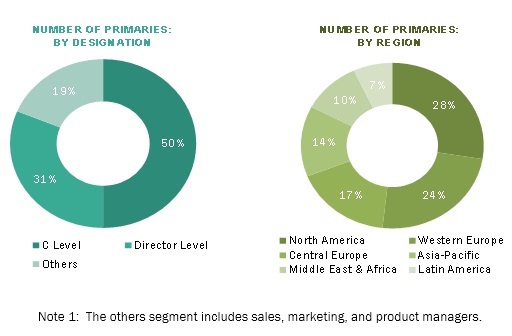 The ink industry is witnessing a significant growth in Asia-pacific, Latin America, and Africa owing to the digital printing and publication industries. What are the upcoming product type of HPPs? Europe is the most active market in terms of strategic initiatives undertaken. Some of the factors driving the growth of this market are high growth of end-use industries, amplified local manufacturing, and increased number of domestic players in various vertical market segments. The major restraints of the market are high price of HPPs and lack of quality control across developing countries. New product launch is the most preferred strategy adopted by the key market players to sustain in this highly competitive market. The major opportunity for HPPs manufacturers is to increase the production of environmentally-friendly HPPs. Some of the important manufacturers are BASF SE (Germany), Clariant AG (U.S.), Huntsman Corporation (Japan), Lanxess AG (Germany), Solvay SA (Belgium), Atul Ltd. (India), Sudarshan Chemical Industries Ltd (India), Heubach GMBH (Germany), Sun Chemical Corporation (U.S.), Synthesia A.S. (Czech Republic), Ferro Corporation (U.S.), and Gharda Chemicals Ltd. (India). Companies in this market compete with each other with respect to prices and product offerings to meet the market requirements. 10.11 Sudarshan Chemical Industries Ltd. Figure 37 Cosmetic Products Will Witness High Growth in the HPPs Market in the U.S. Figure 54 Coatings is the Largest Application of HPPs in the U.K.